Easy online approvals, aggregate training reports, and much more. Access snapshots of your training and supervision data in real-time. View experiential training and supervision experience for each of your trainees and supervisors with a few clicks. Use Time2Track data to gain insights into your program and pinpoint areas of improvement and success. You’ll have access to aggregate training data at your fingertips. 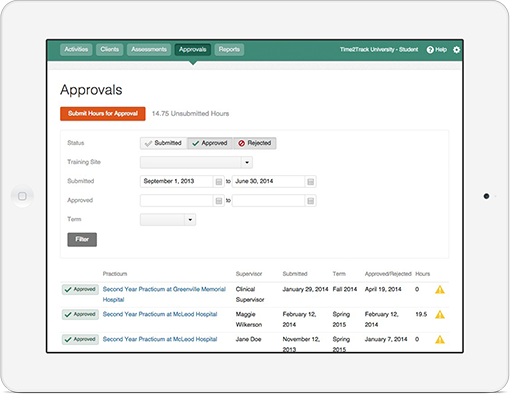 Site supervisors can approve trainee hour logs online, directly through Time2Track. Reduce paperwork and save time by reviewing and approving (or rejecting) hours with a few clicks. Supervisors can approve hours online with a couple of clicks, which means it’s much more feasible to approve activity logs on a weekly basis. More frequent approvals mean less room for error. Time2Track also encourages accountability by tracking changes to approved activities. Time2Track provides a straightforward, user-friendly method for our graduate students to track hours throughout graduate school. Having hours recorded regularly in Time2Track saves them considerable time with internship and licensure applications. Using Time2Track for just 2 minutes each training day keeps you organized and simplifies future requests to quantify your experience.